On Sunday, November 4 2018, a few friends and I hiked up to Mission Springs Trail Camp near PCT mile 239.3. This was my first time here. I tried finding blogs or information on how to get to this primitive campground. My good friend Raquel was recently here as she had planned a hike from Big Bear to Mission Creek in the desert so she agreed to lead the hike. I decided to do a write up on it so others might enjoy the area as well. We saw a few hunters as it is hunting season. Lucky for me they did not have any luck so we were not subjected to seeing a slaughtered buck. I did however hear one gunshot that day. We met at the turnoff to Heart Bar Campground off of Highway 38 at mile marker 33. We drove on a mostly dirt road to 1N02 and found a nice parking area. This parking area is also the starting point for the Santa Ana River Trail which is a popular biking trail which takes you to through the forest past Angelus Oaks and drops you off in San Bernardino. We started hiking up 1N02 due to the fact that 1N02 has been closed to cars because of the Lake Fire from 2015. We reached the Aspen Grove Trailhead in about 1/2 mile and walked mostly uphill with only a slight grade. The forest is very much still trying to recover from the Lake Fire and I saw no new trees growing yet. We reached Fish Creek Trail after a few miles and made a left toward Mission Springs Trail Camp which is very close to the PCT. There we took a nice lunch break and visited the Mission Springs. The spring is located behind the horse corrals on a nicely groomed trail. Just in case, we gathered some water for the second half of our hike. The water was amazingly clean and really cold. Should I have needed the water I would have had to filter it. I do not want to experience the symptoms of Giardia. Once we were ready to continue we decided to walk back to the PCT and take it part of the way back to the cars. Brian was our map person and kept us from getting lost. We crossed 1N05 and could have taken that dirt road but we opted to stay on the PCT and take the unmaintained portion of the Santa Ana River Trail (2E03) and then we took 1N05 which dropped us off at the parking lot. Total miles hiked was 9.3 with an elevation gain of 1,459. We hiked at a nice pace and ended up with a respectable 5 hour hike including breaks and lunch. It was a truly beautiful day with beautiful views. I decided to post this nice little hike outside of Wrightwood near the Jackson Lake Trail because I found it on a map but could not originally find the trailhead or any information online. We took the Jackson Lake Trail for 1 mile and found the Boy Scout trailhead on the right side. We followed the mostly shaded trail that was well maintained. Only found this one tree that covered the trail. We covered 3.7 miles and 900 ft in elevation on the way out. The trail meets up with the Fenner Saddle Trail after about 3 miles. We decided to take the Boy Scout trail to the left of this sign and out to Fenner Saddle Road ( a dirt road that looked closed). If you decided to take Fenner Saddle Road uphill it would take you up to the PCT and you could come back down on the Jackson Lake Trail. We went back the way we came to the Fenner Saddle Trail sign and took it down to another Forest Service Road (4N12) that was also closed. This was a nice wide dirt road with not to much shade that took us across the side of the mountain and back to Jackson Lake passing Mountain Oak Camp. We had some nice views of the mountains and High Desert. The weather was perfect today. Started in the high 60’s and ended in the low 70’s. Here is the map we used to follow the trail. Sunday, May 28 we started early and headed up to the mountains on the south side of Big Bear in the San Bernardino National Forest. We were off on a new adventure and exploratory hike that Diane had recently suggested to the group. I am always excited to explore a new area. We started at 7 am to avoid the heat of the day. We had planned on 8 miles out and back and an elevation of 1,400 feet. We knew we would have views of the north side of San Gorgonio at some point. Our first view of San Gorgonio. The day was going well, the weather was perfect and the trail was quiet. This is not a well used trail which is also right up my alley. Since we were on a new trail Joe took the time to print a map of the area from caltopo.com which is a great site to make and print maps that also show the trails and elevation changes. We stopped several times to check out the map and decided instead of doing an out and back hike that we would do a loop hike. We should still end up with about 8 miles. Our hike is marked by the light red line on the right up to the Campsite at the top and then we followed the old creek trail (thick red line on the left) on the way back and then Highway 38 for 1.5 miles back to the car. We saw a huge group who were on there way back to their van in the parking area. They had been in camp for a few days. We made it to the campsite in a couple of hours and saw a family of three who were also on their way back from an overnight trip. The campsite was so nice with a couple of fire pits and lots of places to pitch tents. View from the campsite with another view of San Gorgonio. Another view of camp as I enter the campsite. Wild Horse Creek is over to my left. As we sat for a quick break we decided we would bring the group back for an overnight backpack. We had another surprise under a rock below the sign above. A fellow hiker from the group had left a note saying he had gone down the same trail we would be heading down after our break. We thought he had left the note for us. We found out later from him that he had left it for Search and Rescue so they would know where to look for him should he not make it home. The hike so far had been pretty easy as it was not to steep. We did have to make our way over, under and around some trees. Diane making her way over a downed tree. The first part of the hike down the creek trail was not too difficult. After a while we found ourselves hiking on the side of various hills, more trees to traverse, through the brush and berry bushes. We also had to make our way through the creek and over and down some small waterfalls. The trail was old and not well used so at some points we lost the trail and found it again. It was so much fun. A REAL ADVENTURE. Lucky for us the day was cool as we were working every muscle group and burning lots of calories as this was pretty much all down hill. Coming over one of the waterfalls. Not much water but sill considered a waterfall. We made great time down the hill even with all the obstacles. We had one more great view of San Gorgonio. Photo has been enhanced in order to see the snake. Thanks Ron. I’m sure some of you might be wondering if we ran into any snakes. Well….. we hadn’t until Diane mentioned it. I quickly said oh I wish you wouldn’t have said that. Now we will probably see one. Not much longer than half hour later, boom….. Joe turns around and says “snake”. I do not like snakes. UGH. We wait as the snake slithers across the shaded trail. I don’t know how he even saw it. The trail was covered by some bushes overhead and was pretty dark with lots of leaves on the ground and he was pretty much was camouflaged. Joe, on the other hand loves snakes and stops to take photos and videos. Diane thinks they are magnificent creatures as well so they are standing so close I am afraid that he will strike at them. I had already made my way behind the two of them while they distracted him (all snakes are him to me). I finally talked them into moving away from the snake so we could get safely away. We made it back to Highway 38 and then had to hike back to the parking area. I am guessing it was about a mile and half street walk. It was about 3 and 1/2 hours down hill and back to the cars. We told Diane at least five times how much we loved the trail. She was so happy to hear that as she wasn’t sure we would enjoy it as much as she had about 5 or 6 years. Today our Mountain Communities Hiking Adventures Group hosted a free lunch for the Pacific Crest Hikers coming through the Lake Arrowhead section of the PCT. The group all chipped in to volunteer their time, talent and groceries to feed the PCT hikers who were more than excited to have some fresh food out on the trail. We provided hamburgers, veggie burgers, hot dogs, chips, kale salad mix, fruits, cookies, candy, nuts, granola bars, soda, water and more. The guys on the bbq and one of the hikers with a to go baggie full of her favorites, M&M’s, cherry tomatoes, chips and celery. We had a couple of guys on the bbq’s, Johnny and Roberto who did an excellent job. We served 70 hamburgers and quite a few hot dogs. The veggie burgers and kale salad were a big hit as were the apples and cuties. The hikers don’t get many fruits and veggies on the trail. The girls went out to check on the signs showing them the way to the free lunch. This morning two of our fellow hikers went out 3 miles to set out signs to entice the hikers to stop by for a free lunch. The hikers started coming in a few at a time and by 1 pm we had over 25 hikers who were super excited to see us and the feast we had set out just for them. We had so many nice compliments – “It was the best spread they had seen in the first 300 miles.” “Name brand soda, this is awesome.” to quote a few. Hikers enjoying a break in their day and a nice lunch. The hikers surprised me as I thought they would eat and get back on the trail. Many of them stayed for hours to chat with us, other hikers or lay out and take a nap. The hikers started in Campo, CA which is at the Mexican Border and have hiked almost 300 miles in 30 to 45 days. They still have to hike an additional 2,350 miles to reach the Canadian border. A hiker checking his phone while he has cell service. Cell service is not always available in the wilderness. Coincidentally the Forest Service was out cleaning up litter from the non-hikers who come out to this area to drink and party and leave their trash behind. Part of this event was to do trash clean up as well so it was great to have them there today. US Forest Service enjoying lunch after trash pickup. It was such a great way to spend the day chatting with hikers from all over the world…. Germany, Israel, Taiwan, France, Estonia, Canada and from the US …. Georgia, Iowa, Wisconsin, Oklahoma, New York, Washington, California, Hawaii and Pennsylvania and many more places. I even got a few new tips for my future backpacking trips from what kind of food to take to how to shave weight from my heavy pack. We are now officially Trail Angels of the PCT and we will hopefully make this a yearly tradition. The definition of a trail angel I found online. These self-appointed volunteers assist long-distance hikers on one of the most grinding outdoor challenges in the world — comparable, many say, to summiting Mt. Everest. And they do it with little or no compensation, other than the grateful smiles and a chance to share in the adventure of the PCT. Labor Day Weekend I spent a few days at Zephaniah’s Promise Ranch in Goldendale, WA volunteering my time and talents. I took my horse Mac up there a little over three years ago to live in green pastures and help the children learn and experience ranch life. I found Mac to be healthy and happy and with a few pasture buddies to keep him company. It turns out that Mac with all of his Parelli training over the years has been a great asset to the program and kids. Steve took on Mac as his primary horse and caretaker. They get along so well. It warmed by heart to see the relationship. Steve and Mac are still working on their relationship but they have made great strides in three years. I was able to give him some ideas on how to improve the relationship. While at the ranch I helped to feed and cleanup and even had the opportunity to help build some pasture fencing. Robin took this really cool pic with Mt. Hood in the background. They have the best views from every acre on the ranch. I had a great time reconnecting with Steve while working on the fencing. Robin has come so far in her horsemanship. They rescued Remy sometime back and Robin has taken her on as a project horse and a companion. While I was visiting I was able to help her get Remy to be more responsive and light. She also needed to learn how to get Remy in the trailer. We spent three days playing the Parelli games and teaching Remy how to jump in the trailer without fear or intimidation. By the third day she had all four feet in the trailer. Robin also spent some time in the saddle working on her riding. Success. Mac and Remy are both used in the kids program, so the time Steve and Robin spend on their horsemanship helps keep the horses tuned up in the off season. They can also pass on these relationship tools to the children to keep them safe around the horses. In addition to the horses, Robin and Steve have planted garden beds and a nice chicken coup. The garden is flourishing and the hens are laying eggs on a daily basis. The kids also get to learn about taking care of chickens and how to manage a garden. I had the benefit of enjoying fresh eggs and fresh vegetables and herbs all weekend. What a nice treat. We also took time on Sunday afternoon to visit an Alpaca Ranch. These animals are so cute and so inquisitive. They were so well taken care of. The alpacas get trimmed once a year and their fiber (fur) is used to make scarves, sweaters, rugs and much more. I came away from the weekend with a great appreciation for what Steve and Robin Mock are doing at Zephaniah’s Promise Ranch. The ranch is a non-profit ranch with all donations going directly to maintaining the horses and providing free equine experiences for children. You can donate to the ranch in a variety of ways. You can mail a check directly to the ranch at 11 Stirrup Lane, Goldendale, WA 98620. If you would like to receive a newsletter or contact Steve or Robin Mock you can email them at info@zpranch.org or by phone at 509-773-ZPR1. Every month grains are purchased for the horses as a supplement to the hay to help with digestion and provide additional nutrients: beet pulp, soymeal, alfalfa pellets, and Senior feed. The average cost of a bag of grains is ($20). Bale of hay ($10.50). Approximately $65 would provide enough hay for 1 horse for 1 month. Purchase a blanket for the winter months ($200). Heater for the additional water troughs we have this year ($50). Farrier cost to trim hooves at $30 per equine. Veterinary Services vary ( $50 to $100). A box of screws for the fencing is ($35). The fencing used prices out to about $7 per foot so a 9 foot section is about ($63). The other way you can donate is to buy your Amazon products via Smile Amazon. Use your current username and password or create a new one. You will be asked to pick your own charitable organization, enter Zephaniah’s Promise Ranch. A portion of your purchase will be sent to the ranch. I hope you can find it in your heart to send a donation of any size. Any donation will make a difference. Your donation is tax deductible. Robin and Steve have taken great care not to mix their personal expenses with the ranch expenses. You can be assured your donations will go directly to the kids program and the horses. Thank you for supporting this amazing program. This year the Flores Family scheduled a family vacation to Mammoth. My brother and his family have been going here for years. My sister, Kim and I decided to tag along this year. My brother Henry couldn’t make it, so I brought his daughter Brijene with me. Hopefully next year my sister Diana and brother Henry can join us. Of course, I did my research and planned some hikes for those who were up for it. The first day we hiked a short 5 miles to the Devils Postpile and Rainbow Falls as I did not want to burn anyone out. Not much elevation gain. Everyone made it back and felt the first day was perfect for a warm up. Day 2, Duck Pass trail with lots of lakes to see. Option one, 5.4 miles round trip to Barney Lake, elevation gain 1,094. Option two, Duck Pass 8 + miles, elevation gain 1,736. I warned everyone the first part of this hike would be steeper than day 1. Patty and Lynn decided to shoot for “Option one” as they have not been hiking to the level that they would like. My nieces decided to go up to Duck Pass with me as they are both softball players and are in tip top shape. We took a quick a break at Barney Lake with Patty and Lynn and then headed up to Duck Pass before the sun was overhead. It was another 1.3 miles, so we made pretty quick time. The view of Duck Lake on the back side of Duck Pass was amazing. The lake was much bigger than I expected. We had a lunch break and then headed back down to the trailhead with a quick stop at Arrowhead Lake. Maddison turned 18 this week so we celebrated her birthday with the best Cajun Seafood BBQ including lobster, crab legs and shrimp. So yummy. I was waiting for the bears to show up for their share. Happy Birthday, Maddison. Schat’s birthday cake to finish off the wonderful dinner. Day 3, We changed our hiking plans. Adrian suggested hiking Dragon’s Back Trail off the backside of Mammoth Mountain. He said it was pretty easy and included beautiful views. I was a little concerned as it was pretty steep. 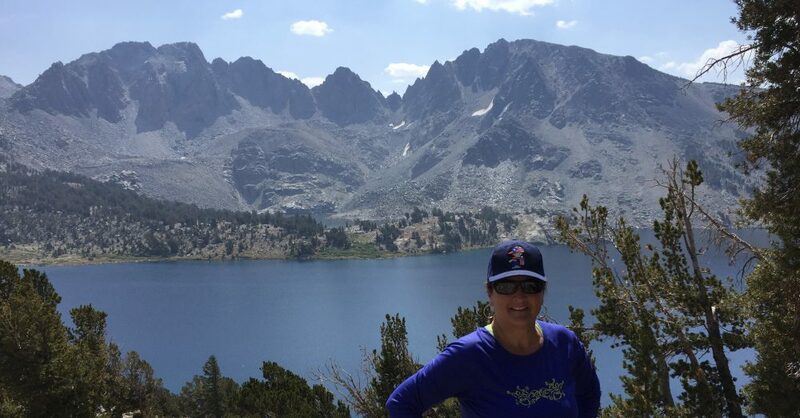 It would be a short hike of 4 miles as we would take the Gondola up to the top and hike down from 11,000 ft and end in the Twin Lakes campground with the total feet descended of 2,300. I had reason to be concerned as the first part of the hike was all exposed with lots of hiking on loose gravel. About two thirds of the way down I felt a little better about the trail. Lots of trees on the trail to catch me should I slip off the trail. We stopped at the Bottomless Pit for a break and then headed down to the bottom of the trail and back to camp with a stop at the camp store for an ice cream treat compliments of Patty. Well earned. Meanwhile back at camp the rest of the crew had been catching fish in the lakes and streams and they even took a trip to Tioga Pas where they caught a bunch of fish in a creek that they found on a previous trip. This was an amazing trip. Can’t wait to do this again next year. NOTE: Met lots of backpackers hiking the John Muir Trail and got some great information for some backpacking trips for next year.